Allergies can put a damper in any spring day, but keeping them in check can be easy. 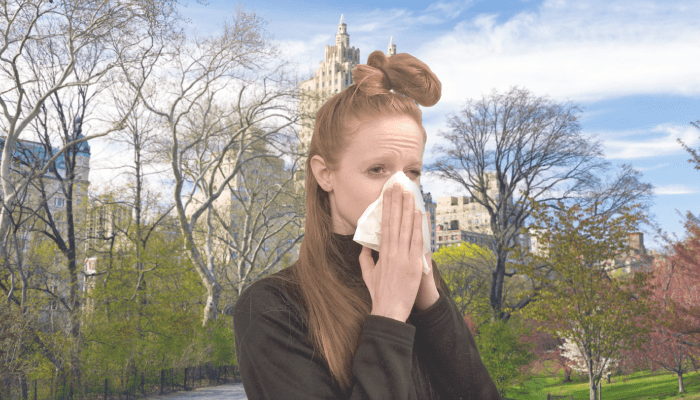 We’re sure you’ve tried your plethora of antihistamines, and while they can be VERY necessary, we wanted to provide you additional natural home remedies and suggestions to keep those itches and sniffles in check. Every time you enter your apartment or house you bring a little trail of where you were behind you. After being outside, on the subway, or even inside at work, your clothes, hair, skin, nails, and shoes are rich with environmental offenders. The ‘no shoes in the house’ policy is there for a reason. Be sure to wash your hands when you come inside, and avoid lying down on your bed without showering and changing your clothes! According to recent research, the more phytochemicals you are exposed to at an early age (i.e. Nutrients you get from fruits and veggies) correlated with fewer adult allergies. There’s no question that a healthy diet keeps your immune system less offended. Work to rotate your fruits and veggies each week for a colorful variety. Spice up some hummus with colorful beets here! If you feel some symptoms coming on, skip the alcohol and caffeine, and load up on water instead. The extra liquid can thin the mucus in your nasal passages and give you some relief. Be sure to include warm fluids like herbal teas, bone broth, or soups that are low in sodium to allow calming inhalation of steam while you sip. Keep it tidy, folks. Harsh chemicals can irritate your ears, nose, and throat which aggravates symptoms. Check your makeup and home cleaning supplies against the Environmental Working Group’s List. Or, make your own cleaning supplies. Use a vacuum cleaner that has a HEPA filter to trap allergens. Do you know all of the offenders? Consider allergy testing and immunotherapy to significantly decrease your allergic response to environmental allergens. FRESH Med at Physio Logic tests for 72 of the most common allergens and is your best choice for allergy testing. To learn more about allergy immunotherapy and how it can benefit you, please download our brochure or fill out the form below.